Amidst all the keen speculation over what Apple might produce with the iPhone XS event on 12 September it can be easy to forget the annual iOS refresh – but in its own way the mobile software that Apple makes is just as important as the regular hardware updates the company puts out. Here we'll give you a complete rundown of everything we know that's coming with iOS 12: the new features you'll be able to use, when the update is likely to arrive, and more. Read on to get right up to speed with everything we know so far. Apple has already previewed iOS 12 at its WWDC event in June, and a beta preview edition is already available for developers to get their hands on. No other dates have been officially announced, but if Apple sticks to its usual routine, the finished iOS 12 should arrive in September. When iOS 12 does finally appear in its finalised form, Apple has confirmed it will work on every device that currently supports iOS 11. No devices are getting dropped from the roster this time around. Much like Android P, iOS 12 is going to include features that make it easier for you to put limits on your screen time: you'll be able to get iOS to put up warnings if you're using a certain app too much, and there's a special bedtime mode for Do Not Disturb that you can use to dim icons and the lock screen when you should be sleeping. The new app usage feature is called Screen Time – it can be used to put limits on the kids or yourself, and the way you use your phone is explained in more detail than ever before. You can even load up graphs that show how often you're unlocking your phone, and at what times in the day. Siri is getting smarter, as you might expect, and will now make better suggestions about apps you might want to open, searches you might want to run, and different actions you might want to take in the day – so maybe a suggestion to open your coffee shop app pops up on the way to work. Then there are Siri Shortcuts, ways to combine tasks and apps together. So if you tell Siri you're heading home, it could send a message to someone in your family, load up the directions in Apple Maps, and turn up the heating if you've got a smart, HomeKit-enabled thermostat at home. We know that Apple loves augmented reality, and sure enough we've got more AR features coming with iOS 12 when it finally arrives. One of those features is shared AR experiences, so you can play games or run apps in tandem with other people – you'll all see the same AR scene in front of you. To get even more people on board with the wonders of AR, Apple is introducing a new iOS app called Measure. It does exactly what it suggests, giving you an augmented reality measuring tape you can draw across the real world to get an idea of lengths and sizes. Those cool little Animoji are getting an upgrade too, if you've got an iPhone X and can make use of them with the advanced forward-facing camera. New Animoji including a ghost and a t-rex have been added, and they should now respond better to your facial expressions – including when you push your tongue out. Apple is also introducing Memoji with iOS 12, little caricatures that show you in cartoon form. It looks like there are a wealth of customisation options here, but again you're going to need the iPhone X and the TrueDepth camera to use them (the 2018 iPhones should all be compatible too). We never thought we'd see the day, but Apple is finally enabling grouped notifications in iOS, so you won't be met with a barrage of alerts every time you unlock your handset. All the notifications from Twitter, Facebook and so on will be grouped by app, if you'd like them to be. Also new in iOS 12 is an idea called Quiet Notifications, where you can send alerts from particular apps to the Notification Centre but not have them pop up on your screen. It's one way to dimiss those chats from WhatsApp and Facebook Messenger than are constantly pinging your phone. 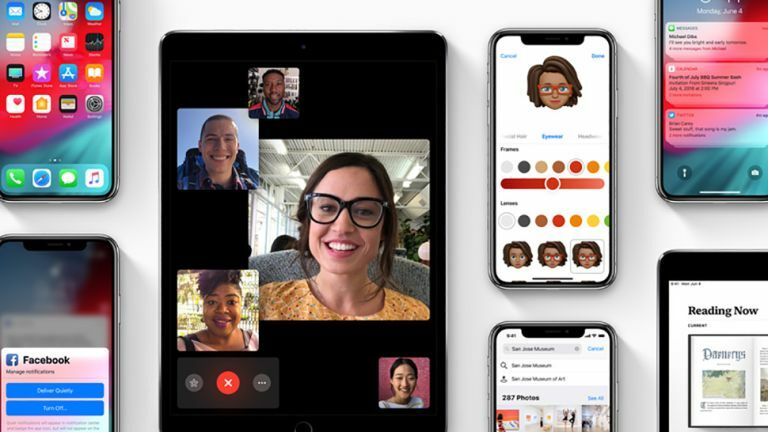 Another feature that we've been waiting for a long, long time is group video calls in FaceTime, and it's been added in iOS 12. You'll be able to chat to up to 32 floating heads from September, with the software automatically working out who's speaking and making their window bigger. As well as the Memoji and Animoji, you're also going to be able to slap all kinds of extra stickers, filters and other effects on top of your camera feed to really stand out in those video messages. There's plenty more coming in iOS 12, including features Apple announced on stage at WWDC 2018 and features it didn't. Apps such as Apple News and Stocks are getting a revamp, with updated interfaces and extra tricks. Photos is getting smarter, with more personalised suggestions about sharing photos with others, and more options when it comes to searching through pictures you've taken and doing stuff with them. You can search through your images more easily with Siri in iOS 12 too. With several more months to go until iOS 12 lands properly, there are bound to be new features to discover along the way: beta testers have already spotted mentions of automatic updates and new gesture controls for the iPad. Make sure to check back regularly, as we'll be updating this article with everything you need to know about iOS 12 as September approaches – how to get it on your phone and what you can do with it when it arrives.